If you decide to try your hand at the role of the interior designer and to paint the window glasses, ceiling lights, lamps or other glass surfaces in your home, you'll first need to transfer the pattern to the surface. the outline on the glass. Method I. Put the skimmed glass figure and draw its contour to the glass. Method II. 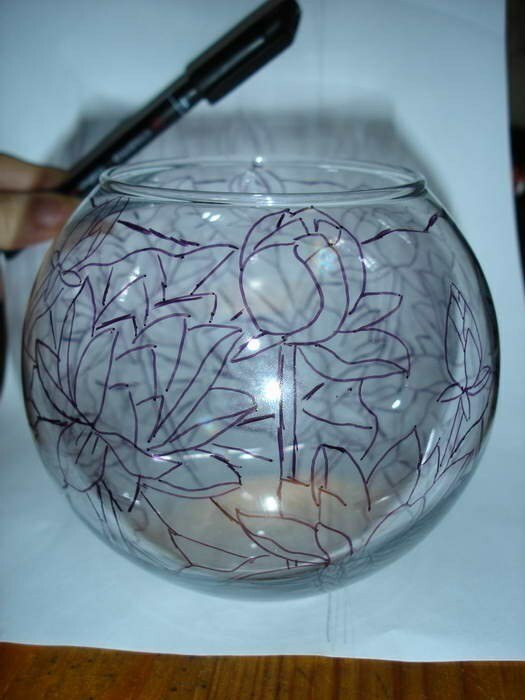 This method is ideal for the transfer of the pattern on an opaque surface or tinted glass. Your chosen picture, if it is on electronic media, print on the printer, placing it in a graphics editor mirror projection images, so that later on the surface of the glass it was an exact copy of the original. Choose the image which are clearly visible the main lines. Lay pattern on a table or other flat surface. Cut a piece of cling film slightly larger than a sheet of paper with the image that the film could be attached to the table top (so the tape doesn't move and the line will clear). Lay the film on the pattern and carefully trace it with a marker. If you are working with dark glass or bright colors, it is best to choose a token white or lemon colors. Degrease the surface of the glass, that is, wipe with a swab dipped in alcohol or Cologne. When it dries, gently turn the film with the transferred pattern from the side to the glass on which you drew with the marker, and press it to the surface. Gently smooth the resulting folds and bubbles on the cooking foil.Take any sharp object, draw them drawing contours. This can be, for example, nail or a pointed matchstick. They will not be able to crush or break the film, when you trace them on the picture. Remove the tape, being careful not to smear the picture. If some details are drawn not to the end, it is better to draw them by hand with a marker, and not impose the picture again. So you just smear the whole picture. Circle a-line contour of glass or acrylic paints and thin brush. When the outline is dry, remains lines drawn with a marker that is not sketched with paint, you can wipe with a cotton swab dampened with water. It is desirable not to RUB the stick along the contour. The flaws made in the application of contour can be corrected with a sharp knife, scissors or blades. Method III. If you need to translate a drawing on an uneven surface, say a lamp, then the selected picture on the paper circle marker alcohol-based. Moisten the sheet with water and press it onto the inside of the canopy. If you need to. On paper, make small cuts to fit snugly to the convex surface. Circle line contour on the glass.